With Ad Builder you can create your own display ads for a campaign based on real data from your competition. Display ads are a type of advertising that comes in the form of a banner, rich media and more. While search ads show up on Google SERPs, display ads leave the confines of the search engine and appear on over 2 million websites and in over 650,000 apps within the Google Display Network. Display ad campaigns help you get your business in front of the right people in more places than just search engines. By certain types of people. You can focus your targeting on a certain set of users based on some criteria to make your ads show up in front of certain audiences (e.g., people who visited your site) or demographics (e.g., young women). In certain context or content. You can focus your targeting on certain moments, specifying your keywords or topics, to get your ads displayed on certain websites or within the certain kinds of content (e.g., articles about electric cars). 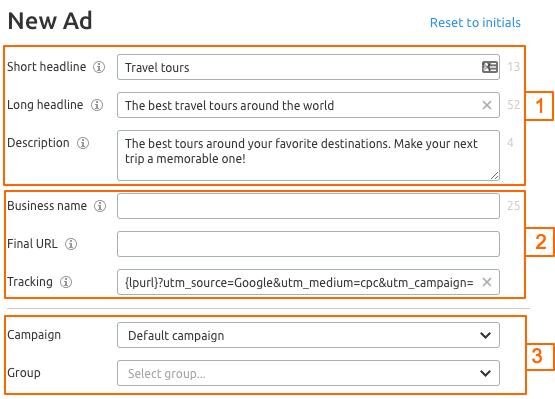 After that you can give your campaign a name and start configuring your campaign settings, including your targeting options. Once you have a campaign setup process in place, choose a display ad type to ensure you’re going to reach people with the right ad messaging. A perfect way to gain a deeper understanding of the competitive landscape is to explore what other successful advertisers are doing. 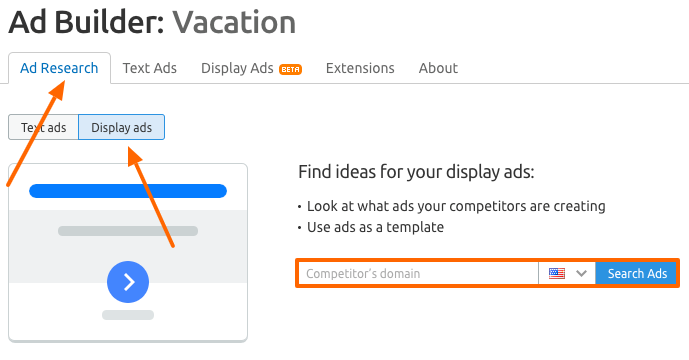 With SEMrush Ad Builder, you can collect ideas for your own display ads based on the ads of your rivals. By using those insights you can optimize your GDN campaigns and increase the efficiency of your advertising strategy. Go to the Ads Research section of the tool and click on “Display ads.” Enter your competitor’s domain in the search bar and collect advertising ideas. Go directly to the Display Ads section and click the “Ad Research” button. You will then be prompted to the corresponding section, where you can start exploring the competitive landscape. Once you enter your competitor’s domain, you will see what display ads your competitors are creating. The data on competitors’ ads are pulled from SEMrush’s Display Advertising reports. Located next to an ad snapshot you’ll see several metrics, including number of times and days we noticed this ad, and when we have seen it for the first time and for the last time. The tool will ask you if you want to add this domain to your domain list. If you click “yes,” this domain will be automatically saved to your list in this project. So the next time you want to research your rivals’ ads in this project, you can simply choose this domain from the drop-down list, without typing it once again. If you click on an advertiser’s link, you will land on the advertiser's landing page that this particular display ad leads to. If you notice some innovative creatives, you can use them as a source of inspiration for your own advertising campaign. We are constantly searching for new ads of your competitors to provide you with fresh recommendations. To see our suggestions, click on the “Recommendations” button in the top right corner of the Ad Builder interface. If we discover any new ads, we’ll generate new recommendations for you. Once you find creative inspiration and collect ideas, you can move to the next step of crafting your display ads. In the Display Ads section of Ad Builder, click on the “New Ad” button and choose “Manual” in the drop-down list to craft a new ad creative from scratch. In the new pop-up window, you can delve into the creative process. 1. First, write a clear and compelling headline and description. A headline serves as the first line of your ad. Be sure to write both a short headline that appears in tight ad spaces and a long headline that shows up instead of your short headline in larger ads. Then write a description, making it appealing and easy to understand, and avoiding generic texts. While filling in the fields, you will see how many characters are left, so you can keep your headline and description within the required limits. 2. Fill in the “Business name,” “Final URL,” and “Tracking” fields. Write the name of your business and brand. In certain layouts, it may appear in the text of your display ad. Add the final URL where people go after clicking your ad, and a tracking code. You can attach UTM parameters to your URL so that your URL will track information about a click. 3. You can also choose which campaign and ad group this ad will belong to. 4. Add images and logo you’re going to use in your ad. Be sure to add both landscape and square images. Pay attention to the image and logo requirements. During the creative process, you will be able to preview your ads before you make the final edits. Click the “Prev” and “Next” buttons to see different examples of your ad. As display ads offer many options, you can experiment with different images, colors, and content to make the most of your advertising campaign. Finally, save your ad by clicking the corresponding button. After saving your ad, you will return to the main interface of the Display Ads section. Here you can view the list of your ads. If you need to edit, duplicate, or delete your creatives, go to the settings button and choose the option you need. Ad Builder also allows you to upload your already existing ad campaign and edit it in the tool’s dashboard. 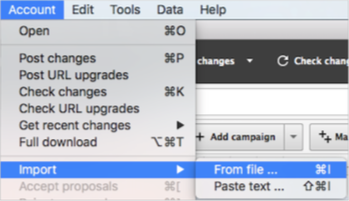 Once you click “New Ad” and choose “From file,” you will be able to import a .CSV or .XLSX file. Ensure that your file contains 7 mandatory attributes: Campaign, Ad Group, Short headline, Long headline, Business name, Final URL, Description. While uploading it, you can choose your target location down to the city level. Once the file is imported to Ad Builder, you can start editing it and then save it. The ads created will be saved into .ZIP archive. 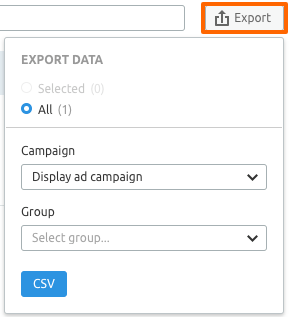 When you feel you’re done with your creatives, you can export your ads to .CSV file which can then be imported into your Google Ads Editor account. To do this, you simply need to click on the export tab in the top right corner of the Ad Builder’s interface and choose whether you want to export all of your saved ads or selected ones. 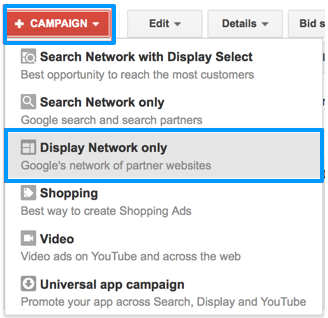 To upload your display ads to Google Ads Editor account, select “Account” and “Import” on the Editor menu. Upload your CSV file and your Display Ad campaign will be ready to launch!